Most packers and movers services take place during the day, but in some situations, it is crucial for customers to move overnight on the weekends because of their individual work schedules or commitments, administrative or commercial Limitations, and various other reasons like just to avoid the worst of weekday traffic around the major cities of Australia. 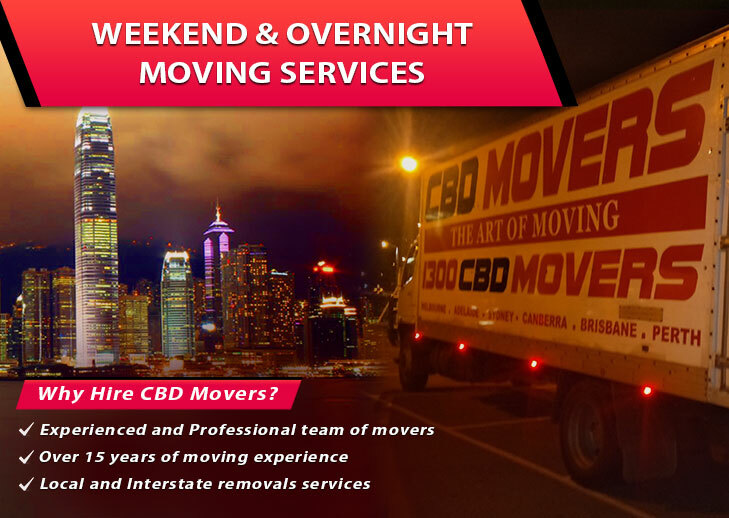 At CBD Movers, we provide weekend or overnight moving services in Australia with the surety of world-class service quality at the most affordable cost. We are committed to being adaptable to our customer’s needs as per their specific time and weekend schedule to ensure a smooth, safe, and in time moving experience. Usually, the government authorities do not allow the large moving vehicles or trucks to enter a city just to avoid traffic congestion. Also, many residential societies, commercial shops, stores or Malls preferably fix the late evening or early morning time for the delivery of products usually on the weekends to avoid the onsite work disturbances. In such a scenario, there can be no better choice than a special weekend or overnight moving services in Australia. Sometimes your schedule just works out at the fixed time in the weekends evening for organizing an important event, party or delivery of your important parcel. In such conditions, you definitely need to avoid the worst of the traffic on a move to reach the destination on time, and at CBD Movers, such weekend or overnight moves are always possible. At CBD Movers, we know that your belongings and time is very precious to you. So, we have initiated this specialized Weekend or Overnight Moving Services to accomplish all of our customers’ needs in the country. We are one of the leading, fully-licensed and insured Movers and we can handle all of your belongings with the utmost care to avoid any kind of damage along the way, even in a hurry. All our professional movers are trained in a very complex overnight moving programs to ensure that they work with full-perfection while delivering fast and safe overnight moving services in Australia. If you or any of your relative or friend is looking for the top-notch and reliable moving services in Australia then look no further. At CBD Movers, we provide the one-stop solution for all sorts of moving and storage needs including an array of residential, official or Furniture removal services, Industrial or Commercial delivery of products, as well as temporary or long-term warehouse and self-storage facilities. Next PostNext Is It Really Worth Getting The Professional Support of Furniture Removalists in Melbourne?